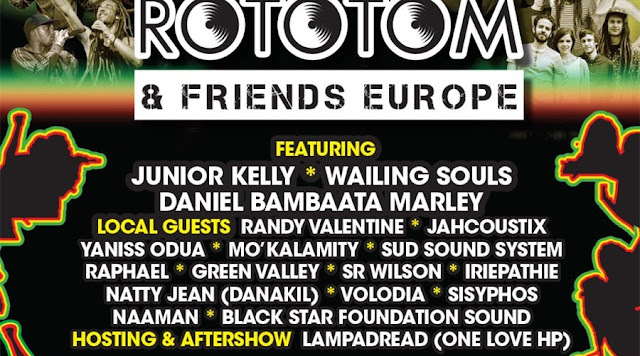 Junior Kelly, the historical Wailing Souls and the young Daniel Bambaata Marley will play along with other remarkable stars of the European reggae during the Rototom & Friends Europe Tour 2016. For the first time, the Rototom Sunsplash moves from its classical location and changes its summer dates to be transformed into a night full of great emotions and love for reggae music, during a tour in different countries of Europe. The itinerant tour Rototom & Friends Europe will host the ‘new roots’ poet Junior Kelly, a historical band such as the Wailing Souls, and Daniel Bambaata Marley, the young promise who carries with him the heritage of Bob Marley (Ziggy’s son). In addition to this trio, we will offer a fluid and changing line up, thanks to the presence of different European artists, who will characterize every session with their version of reggae culture in the countries where the tour will take place. On stage, there will be, according to the countries, Randy Valentine, Jahcoustix, Yaniss Odua, Mo’Kalamity, Sud Sound System, Raphael, Green Valley, Iriepathie, Black Star Sound, Natty Jean (Danakil), Sisyphos and Volodia. At the end of the concerts, we will leave the stage to the dancehall and sound system culture with the selections of Lampa Dread, selector of the Italian sound system One Love Hi Powa. While waiting for the new edition in Benicassim in August of 2016, the vibes of Rototom Sunsplash will invade Europe for a series of not-to-be-missed nights!